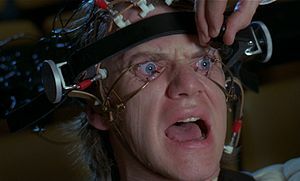 The Ludovico Technique is a form of compulsory deprogramming featured in both the book and film A Clockwork Orange. It consists of forcing a patient to watch horribly graphic murders, rapes, and other severe brutality while under the influence of an addictive, nausea-causing drug. The therapy’s intent is to train the patient to reflexively respond to violent impulses, acts—even thoughts—by undergoing debilitating nausea, thereby discouraging antisocial behavior. In the title sequence of the stop-action animated series Robot Chicken, a mad scientist straps a cyborg chicken to an electric-chair, pries both her real eye and her Borg-red eye open, and forces her to watch a wall of tiny TV screens: an onslaught of pixelated pop culture. Essayist Mark Dery regularly volunteers for both treatments. Unblinkingly, Dery examines America’s Bizarro-World facets, taking notes on what must an asbestos keyboard. His stickleback-funny collection of diatribes is an incredibly satisfying disemboweling of an array of topics which—although disturbing to most of us in a vague, “that’s just wrong” sort of way—warrant examination by just such an acidic—encyclopedic mind. Here’s the book’s equivalent of a mission statement: [Dery has…] “…the unshakable conviction that, while some beliefs may be ethically indefensible, morally repugnant, or universally unpopular, no subject should be ruled out of bounds, no thought forbidden; intellectual freedom is unimaginable without the right to think the unthinkable.” Hear, hear. The New Age sentimentalization of the dolphin as a guardian angel with a blowhole. …These are the people who brought you Saint Bartholomew, the flayed martyr with his skin flung jauntily over his shoulder, like Frank Sinatra on the cover of Songs for Young Lovers, and the beatified truck-stop waitresses Saint Lucy and Saint Agnes serving up their plucked-out eyeballs and severed breasts on platters, like blue-plate specials. Pretty great stuff. There’s tons more. I love lists—and Dery’s variegated, kaleidoscopic, clever new book. When you procure your own copy, tape your eyes wide open and have a notebook handy. Or a razor blade—if you’d rather take permanent notes on your arm.